“The One”, our Chairman explaining cornering technique. 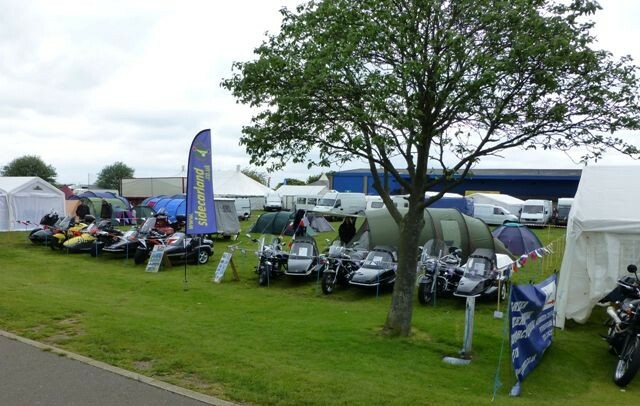 This rally is held at the East of England Showground near Peterborough and has been held here for many years. Saturday started grey and it did not change that much during the day; however it stayed dry, which was a good thing. Walking towards the club stands I spotted a Harley rider coming in with a small dog sitting happily on the petrol tank. 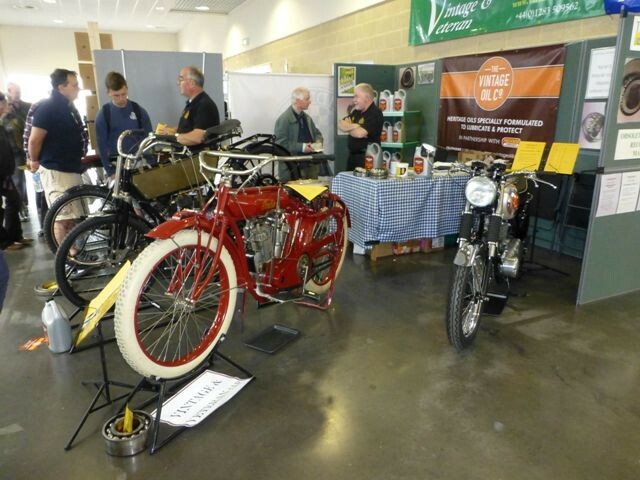 The Federation, the London Sidecar Club and the Hedingham stands were close together, and Tri-Anglia Wheels had a new place close to the manufacturers stands. The club was pleased with their new position, as there were more people passing by, and they hope to get the same spot next year. The show is billed as Europe’s biggest outdoor bike show; however some people felt the show was a little smaller than last year. The entrance fee was £18, although there were some discounts to be had. The entrance fee and the weather may have put a few people off on Saturday. 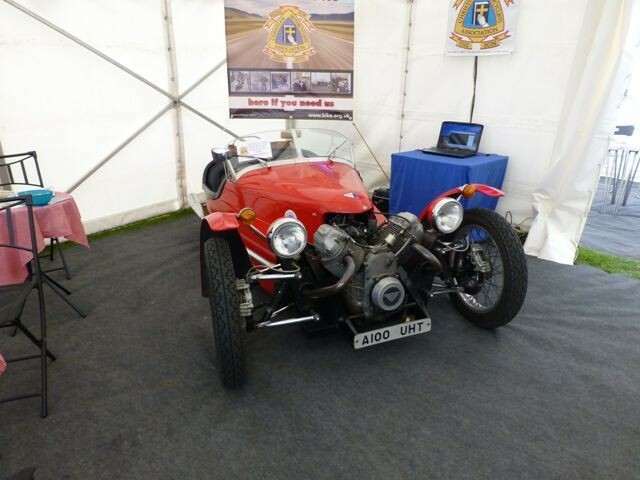 The interesting thing was that the sidecars attracted a lot of attention, and we had more interest on Saturday alone than over the whole weekend last year. 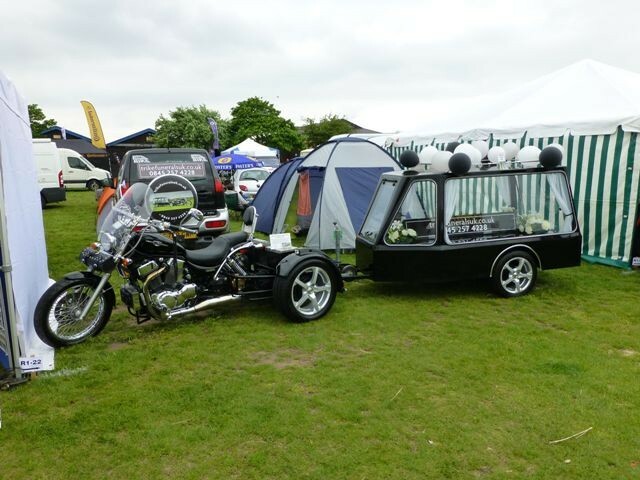 Hopefully this will lead to some more sidecars being on the road. One of the people that I talked to was Brian Rust; he was British Grass Track Sidecar Champion twice in the early 1960s and another year he was runner up. We got talking and I thought that I had heard the name Rust before. I remembered that I had met Brian’s son, Colin, at the Wolds’ Bikers Charity Night at the Coach and Horses pub at Billinghay. 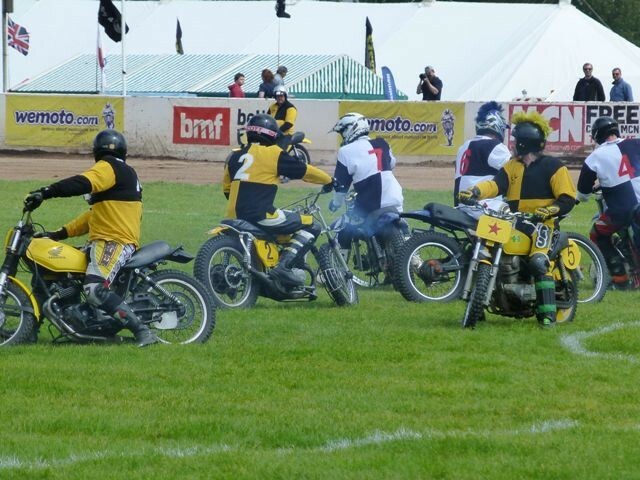 Colin used to race a Norton Rotary outfit at one time, he now does demo runs on it. Colin had told me that spares are getting difficult and expensive to obtain for the engine. He also has plans to set up a sidecar museum sometime in the future. 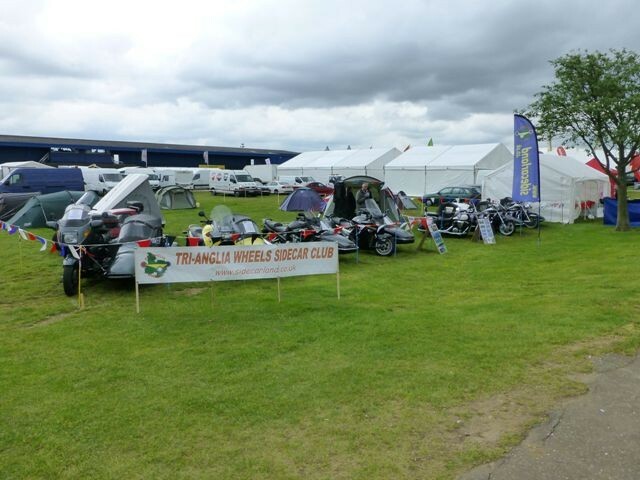 There was a nice selection of club stands, with plenty to look at. 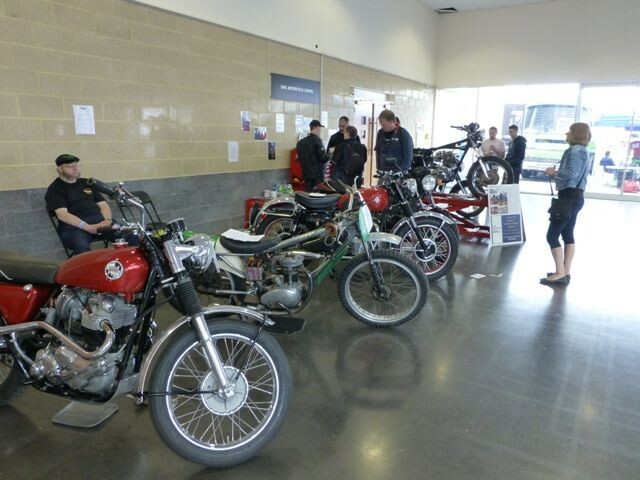 New for this year was a Classic and Vintage Zone; this was a little disappointing, with only 30 bikes on display. 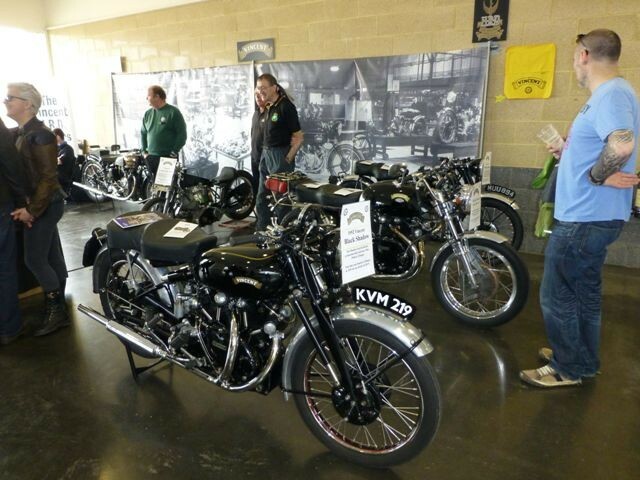 The Vincent Club made a good effort – Dave Johnson had his Vincent outfit on display and several other bikes including an Elgi-Vincent. They also had a sectioned engine on display. On the spur of the moment the Vincent boys decided to fire up one of their machines outside, the bike gathered quite a crowd before it was shut down. Another new feature was the Adventure and Overland Touring Zone – here there were tour operators, travel experts, luggage suppliers and the things that you may need to start out on your ride. 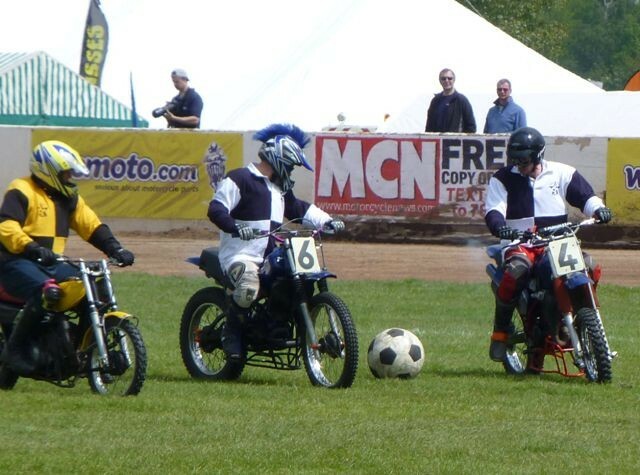 There was a full programme of events in the main arena on both days – these included Moto-ball, Inch-perfect gave a demo of trials riding skills and of course the usual moped enduro. 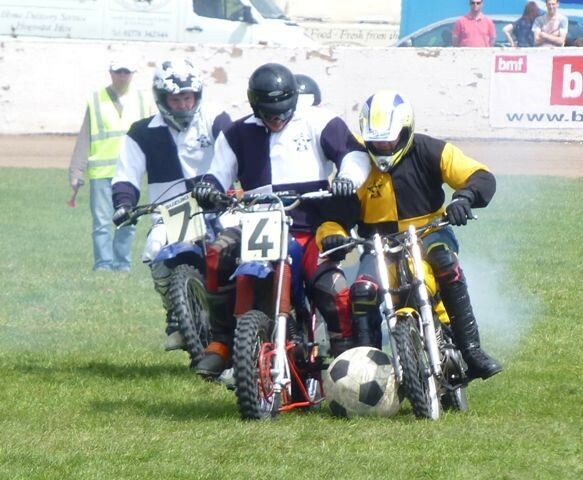 However there was no sidecar racing this year. I was told that the musical entertainment was good on Saturday night. On Sunday morning the sun shone, and continued to shine all day; it was the nicest day, weather-wise, at this rally for the last three years. This made a difference to the spectators arriving, and the ground definitely filled up more than it had on the Saturday. People seemed to be buying and the stalls were busy. Crash helmets could be purchased from £20. I also spotted a stall selling T-shirts for £2 each or three for a fiver. There was lots of stuff to look at. 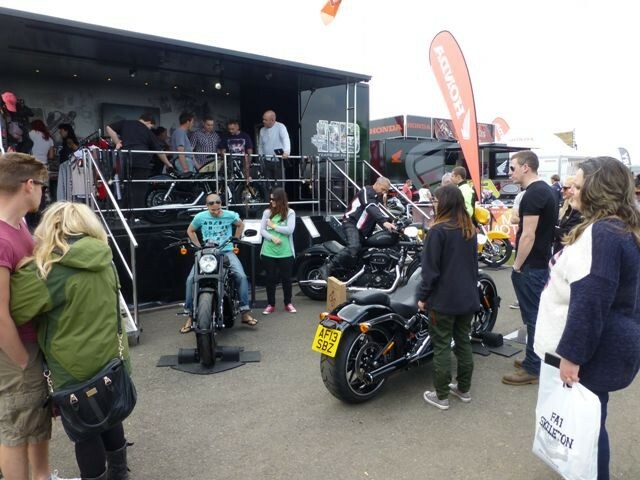 The dealers’ / manufacturers’ stands were good, including Victory, Honda, WK motorcycles, Kawasaki and Ducati. Haywards of Cambridge had Enfields on display. Dave Stanley, of Haywards, told me that the prices of the machines had been reduced; you can now get a 500cc Enfield for just less than £4,000. He said that the build quality of the new bikes is good and that the factory is turning out 70,000 machines a year. For those of you old enough to remember the Enfield 250cc Continental GT machine, there is now a model styled on this machine, but with a larger engine producing 33 bhp. As Haywards sell the occasional outfit they receive copies of “Outlook” so they can pass on details of the Fed and sidecar clubs to the new owners. 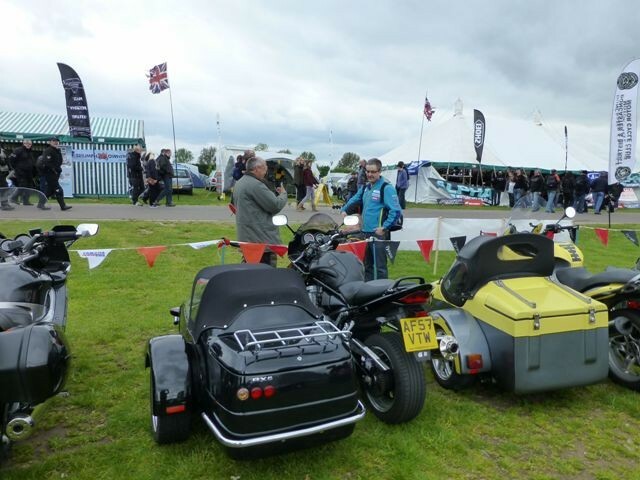 This was a really good weekend, helped by the weather, and with lots of interest in sidecars. There were some nice machines of all ages to look at. The Wall of Death ride seemed busy, and there were lots of stands to interest visitors to the show. There were plenty of food and drink outlets to cater for all tastes. On Saturday during the afternoon a Lancaster aeroplane flew low over the ground. This week was the 70th anniversary of the Dambusters Raid, and on Thursday the Lancaster had taken part in a memorial celebration at RAF Scampton in Lincolnshire. 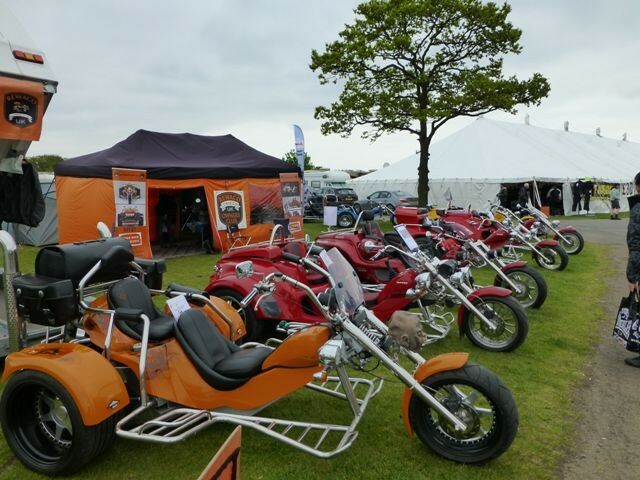 Good weather on both days would be nice for next year BMF Show. 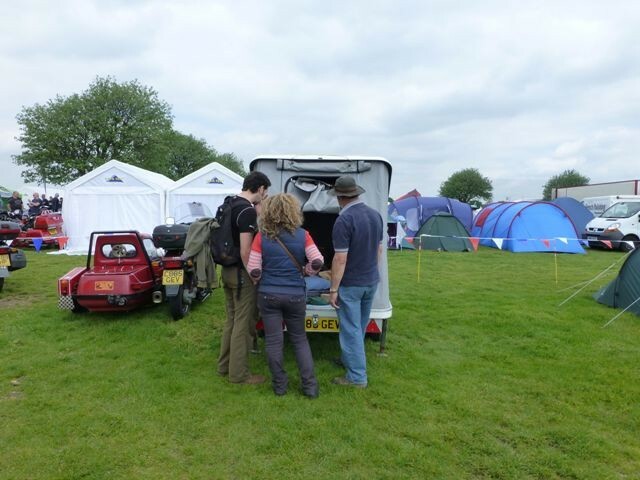 Lastly, one of our club members was speaking to a representative of a well known motorcycle dealer / trike importer at the show. 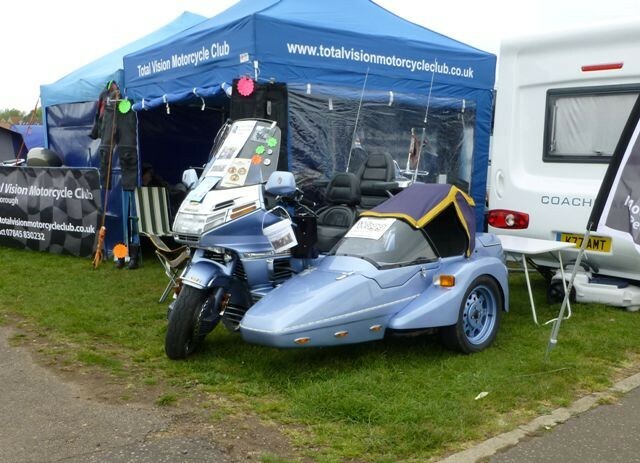 He advised our member, that that the law now, means only a dealer can fit a sidecar / build a sidecar outfit and an individual cannot build / assemble one as they are not deemed competent. Let Sidecarland put the record straight. 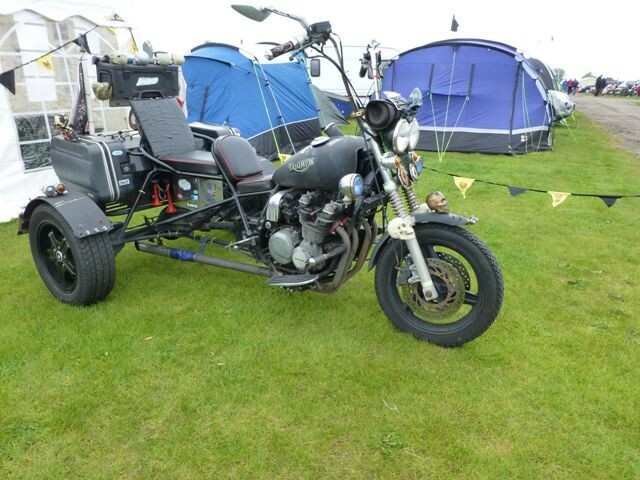 You can currently build / assemble etc an outfit at home, as far as Sidecarland can ascertain there is no law to say you can’t. 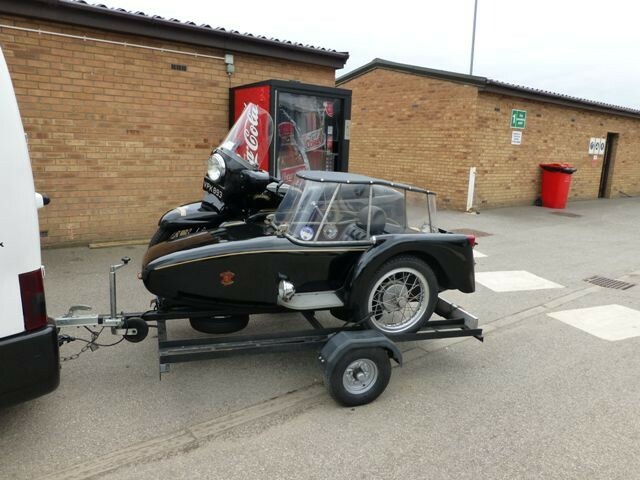 When you present the outfit for an MOT, the bike and sidecar is inspected and if a pass is given it is legal to use on the road provide all other requirements are met. E.g. Tax and insurance. 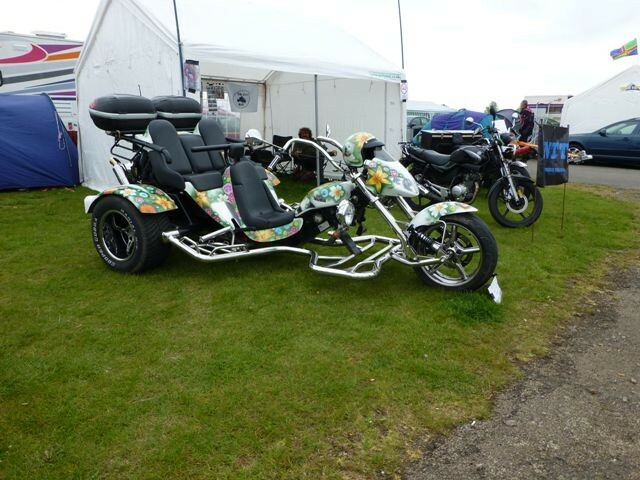 Sadly it appears even the dealers haven’t a clue, and if someone was thinking of getting a sidecar they may well be put off when informed that only a dealer can build an outfit as we know, that would come at a premium price.